The Watergate saga is both fascinating and intriguing, because it raises the question of whether a person occupying the highest political office in the US could be removed or forced to resign specifically for juridical reasons, rather than at the will of the deep state. The Watergate affair erupted in an election year on June 17, 1972, when men were caught breaking into the Democrat National Committee offices at the Watergate Complex. In spite of it, in November, President Richard Nixon swept to a second term with the greatest landslide in US election history. Apart from the power of incumbency, Nixon was riding high in public esteem on his entente with China, the signing of the anti-ballistic missile treaty with the Soviet Union, and the imminent withdrawal from Vietnam. Nixon’s initial rhetoric against Communism had originally endeared him with the right. On January 8, 1973, five persons pleaded guilty to the charges of the Watergate break in, which then seemed destined to fade into total obscurity. On January 27, 1973, a week after Nixon’s second inauguration, the Paris Peace Accord was signed over Vietnam, and the US involvement there was officially ended. Nixon’s volte-face over China and the missile treaty with the USSR did not go down well with the war hawks behind the throne. Now they found the US disengaging from Vietnam without victory. The American people were ecstatic. The war hawks were not. What had seemed dead and buried, Watergate suddenly flared up again, and with a vengeance. The President had thus far never been publicly dragged into the affair. Then on the February 28 Senate hearing for his confirmation to the post of director of the FBI, Patrick Gray, nominated by Nixon himself, if you please, stunned the world by stating that the President’s advisor John Dean had “probably lied to the Watergate investigators”. On March 17, a sixth convicted burglar James McCord decided to write a letter to Judge John Sirica, in a “sudden attack of conscience”, to inform him that some of his testimony was perjured under pressure. He said the burglary was not just a CIA operation, but had also involved other government officials higher up. Then on June 3, John Dean, the President’s own advisor and confidant, informed the Watergate investigators that a cover up had been staged. He said he had spoken to the President about Watergate 35 times, detailing also that in his opinion, up to a million dollars may have been needed to pay those involved for keeping mum. Now if there is one thing that investigators do not believe in, it is coincidence. I have no doubt that there could well have been enough evidence to show that the President may have been cognisant of a cover up. This would have constituted the serious offence of obstruction of justice. It would not surprise me. Nothing in politics does. And Nixon was hardly a saint, to put it mildly. Did the power behind the throne suddenly get its minions and pawns to orchestrate a White House spring cleaning job, to evict its tenant? But what does surprise me is the perfect confluence of two major events. After 10 years of one of the greatest nightmares of the American people, the Vietnam War, which had claimed over 58,000 dead Americans and so many more Vietnamese, the US President had finally pulled them out, and their boys were going home. Then out of the blue the Watergate phoenix suddenly rose out of the ashes, brought back to life Lazarus style, as conscience stricken CIA officials informed Congress, with a Democrat majority in both Houses, that their orders came from much higher up. Right on cue and in tune with the hymn sheet, the President’s very own top advisors and confidants decided to rat on him, and say that he was cognisant of the cover up. Were these spooks and wily politicians really being moved by their conscience, or rather by the power elite pulling the strings from behind the throne? If it were conscience, then why had they not stirred before the November elections? There is more. Such claims would not have been enough to boot out this pesky Vietnam/China/Missile Treaty President. Hard evidence was needed. Lo and behold, we then get yet another ‘prick of conscience’ and ratting on the President. On July 13, 1973, one of Nixon’s very closest confidants and a top White House aide, a military man no less, Alexander Butterfield, comes forward. He tells the Senate that, oh, by the way, yes there could be evidence. 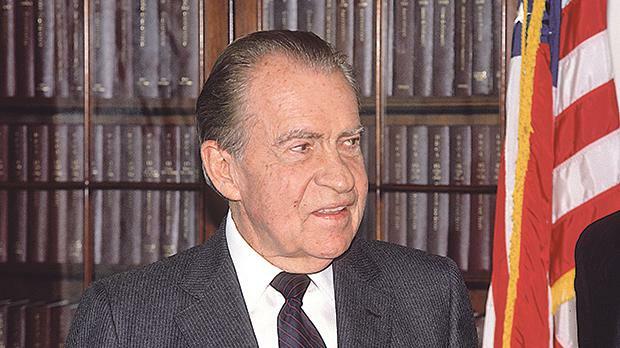 Unbeknown to Congress, in 1971 Nixon had decided, or ‘was advised’, to record all communications in his oval office. So all the Senate had to do, he said, was procure the President’s very own White House tapes, to use against him. The treachery Nixon suffered from his own team was what actually took him down. History should not forget that part of the equation. Was it really justice in action, or in effect just another great victory for the power elite, whose agents fed their own boss to the lions, to the sheer delight of the Democrat-controlled Congress? Were the American people right in believing that democracy was actually in full operation? Or were they hoodwinked yet again, as Watergate took precedence over the huge historic events of détente with China, the withdrawal from the Vietnam war and nuclear arms control with the Soviets? There are no excuses for cover ups and obstruction of justice, that is certain. But it is very telling that the US went through a huge obstruction of justice in the form of the botched up investigation into the assassination of President Kennedy and the subsequent cover-up. Then a case far less serious, like Watergate that had its perpetrators already in jail, was suddenly reinvestigated with inquisitorial fervour and zeal. This far smaller cover-up was then blown clean out of the water thanks to the White House rats. It is also very ironic how while some JFK assassination documents remain top secret or heavily redacted to this day, Nixon was immediately expected to hand over rolls of White House tapes of all the meetings he had in his Oval Office, as if the whole set up of official secrecy and confidentiality did not even exist. Talk about various weights and measures. The final chapter in this comedy of errors was the sudden attack on the Vice President Spiro Agnew, leading to his resignation in December, 1973, for undeclared income and unpaid tax from the time he was a State Governor years back. Again, was the timing of this other inquisition coincidence? Sure! Pull the other one. So the US lost both elected leaders in a matter of months. Overnight it had a new face, unelected Gerald Ford, suddenly plonked in the White House. By whom, exactly, I might ask? Watergate was very wrong, there is no denying. But the whole process exposed more than a bugging affair and high-level cover-up. When presidents fall out of favour with the deep state, in one way or another, if they are not killed, they can be taken out of the equation in other ways. They can even be removed from power while not even being replaced by an elected vice president.